Chronic wounds are defined as an area of skin breakdown that has not shown signs of improvement in 4 weeks or fails to heal in 8 weeks. These types of wounds include non-healing incisions, diabetic wounds, venous stasis ulcers or pressure sores. Diabetes, poor circulation, pressure, nutritional deficits and/or smoking have all been shown to affect the normal healing process of wounds. Platelet Rich Plasma (PRP) treatments are now used to aid in the healing of chronic wounds. As the name suggests, the substance is a by-product of blood plasma that is rich in platelets. Until recently, PRP treatments were confined to hospital settings due to the cost of separating platelets from blood and the large amount of blood needed to produce a suitable quantity of platelets. New technologies have allowed doctors to bring the procedure into offices and clinics. PRP allows the body to take advantage of normal healing pathways at a greatly accelerated rate. During the healing process, the body rushes many cells and cell-types to a wound to begin healing. Platelets are among those cells. They perform many functions including blood clot formation and the release of growth factors into the wound. These growth factors assist the body in repairing itself by stimulating stem cells to regenerate new tissue. The more growth factors released, the more stem cells stimulated to produce new host tissue. PRP allows the body to heal faster and more efficiently. There are also some proteins included in PRP that can be selectively isolated to promote anti-inflammatory effects and pain reduction. Scientists have now developed tools to selectively isolate cells or specific growth factors within PRP that allow for the customization of treatments to reduce inflammation while simultaneously stimulating repair. Using PRP to treat chronic wounds is a relatively new treatment offering. Dr. Lea has had great success in treating chronic wounds, burns and abrasions. 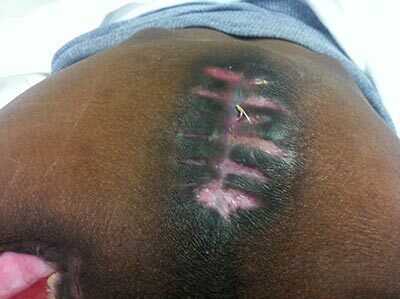 This is a chronic stage four pressure sore that had been present for over three years without closure. Stem cells and healing factors were harvested from the patient's own blood to treat this wound with a dressing once per week over a 10 week period. 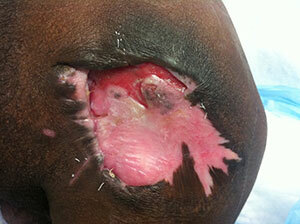 This is a second wound on the same patient which was being treated simultaneously with a separate dressing. It had devitalized tissue on its surface. Once treated we were able to achieve a healthy wound base that would allow for primary closure which occurred on week 10 and was followed for incisional and closure integrity up to week 16. 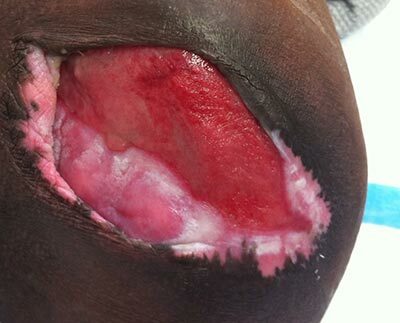 There was no dehiscence or further breakdown of this wound.